September 10, 2010 - Original Tuskegee Airmen Colonel Kenneth O. Wofford of Minneapolis, Minnesota passed away Sunday, September 5th in his home in Golden Valley at the age of 88. Wofford studied at the Tuskegee Institute and trained at the Tuskegee Army Airfield, Alabama were he served as a pilot with the 99th Fighter Squadron in World War II. 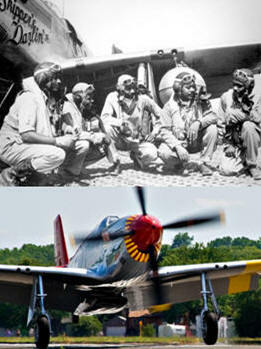 The 99th Fighter Squadron was originally formed as the Army Air Force's first African American fighter squadron. The personnel received their initial flight training at Tuskegee, Alabama earning them the nickname Tuskegee Airmen (see Narrative Of The Tuskegee Airmen). The squadron was originally scheduled to fly air defense over Liberia but was diverted to the Mediterranean Theater of Operations. While operating from North Africa the unit supported the reduction of enemy fortifications on Pantellaria and Tunisia and won a Presidential Unit Citation in the process. The 99th supported Allied invasions of Sicily and Italy and provided close air support to the U.S. 5th Army during its assaults on Foggia and Anzio and for French and Polish armies in their attack on Monastery Hill near Cassino. On January 27 and 28, 1944, Luftwaffe FW 190 fighter-bombers raided Anzio, where the Allies had conducted amphibious landings on January 22. Attached to the 79th Fighter Group, eleven of the 99th Fighter Squadron's pilots shot down enemy fighters, including Captain Charles B. Hall, who claimed two shot down, bringing his aerial victory total to three. The eight fighter squadrons defending Anzio together claimed 32 German aircraft shot down, while the 99th claimed the highest score among them with 13. The squadron won its second Distinguished Unit Citation on May 12?14, 1944, while attached to the 324th Fighter Group, attacking German positions on Monastery Hill (Monte Cassino), attacking infantry massing on the hill for a counterattack, and bombing a nearby strong point to force the surrender of the German garrison to Moroccan Goumiers. Wofford graduated from the Tuskegee Army Flying School in Class 45C-SE on May 23, 1945, were he learned to fly the P-40 and P-47 fighter planes. ?Initially, the Tuskegee school was an aviation experiment that was set up to prove that we would fail,? said Wofford. ?They wanted to prove that American Negroes did not have the capability to fly, and to show that they would be cowards in combat or that we couldn?t use the technology. They even built a separate airfield for us because they didn?t want us flying with the whites. The thing was, we were all academically qualified. Probably 80 percent of us had college degrees.? During World War II, in much of the United States, African Americans were still subjected to Jim Crow laws and the American military itself was racially segregated. Legal and social prejudice prevented the Airmen from flying combat missions. Despite their adversities, the Tuskegee Airmen flew with distinction, in 2007, 350 Tuskegee Airmen and their widows received the Congressional Gold Medal, and the airfield where they trained has been designated as Tuskegee Airmen National Historic Site. Although some sources claimed the Airmen had a perfect record in their 15,000 missions as bomber escorts, recent research has revealed they lost only 25 bombers. Wofford spent 32 years in the military as a pilot to including time in the Vietnam War. He held numerous command positions before retiring the military. Wofford then went to work for the Minnesota Department Of Transportation, Aeronautics Office. Wofford was also actively involved with youth aviation education, urging youth to finish school and study technology. He served as a consultant, mentor and administrator for both local and national youth programs as a career day speaker, Boy Scout mentor, Junior College ROTC program advisor, Air Guard Museum docent and Civil Air Patrol educator. He also served as the Air Force Association?s education advocate. 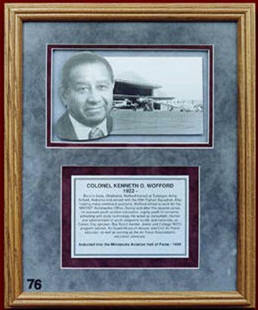 In 1999 Wofford was inducted into the Minnesota Aviation Hall of Fame. Wofford also became involved with the Commemorative Air Force?s Red Tail Project a non-profit Commemorative Air Force (CAF), promotes the restoration and exhibition of the World War II era P-51 Mustang. The restored plane flies as a tribute to the 332d Fighter Group, also known as the Tuskegee Airmen, whose distinctive red markings on tails of their P-51s gave the project its name. For more information on the project you can visit the Red Tail Project website.